Sight Fishing Stillwater Rainbow Trout .. Most flyfishers enjoy fishing for many species of fish with various methods, but everyone has a favourite that really gets their blood pumping. 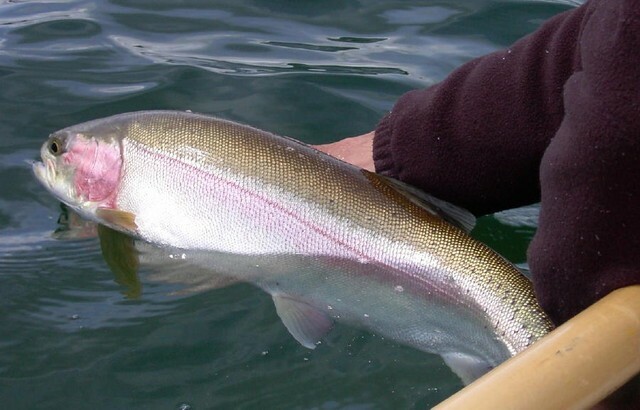 It might be dry flies for summer run steelhead, chasing cutthroat trout in Fraser backwaters or a host of other opportunities we are blessed with in B.C. 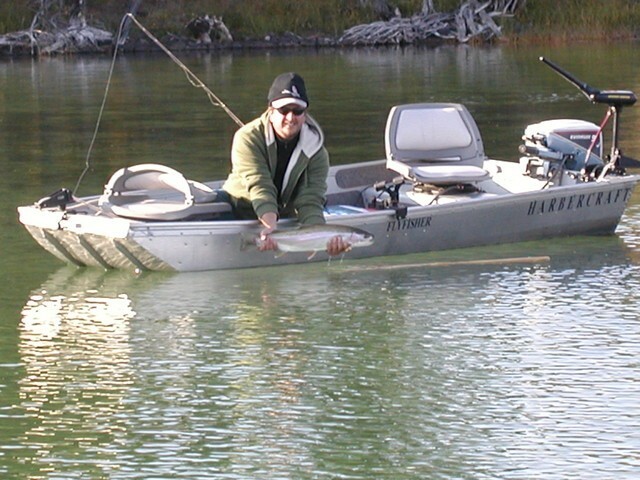 My favourite is sight fishing for large Rainbows on clear lakes in the B.C interior. I often refer to it as “ B.C Bone fishing” because of its similarity to Bone fishing in the tropics. With my modest income and a growing family it is probably as close as I will come to real Bone fishing for quite a while. Sight fishing can be either the most rewarding or the most incredibly frustrating fishing you will ever encounter. It is not possible on all lakes because there just isn’t enough visibility in many of them. 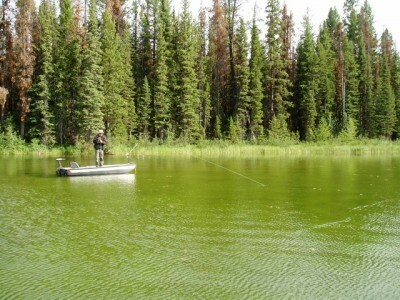 A good sight fishing lake will have very clear water and marl (or partially marl) shoals. Some lakes that have the right conditions are still not good sight fishing lakes, however, because the fish are very rarely on the shoals, or else they are so spooky that getting within casting range is next to impossible. The information I have learned from years of sight fishing has increased my skills as a fly fisherman immensely, and can do the same for you. By watching the fish’s reaction to your presentation you get instant feedback on different flies and retrieves. Is the fly ignored? Does the fish inspect but reject it? 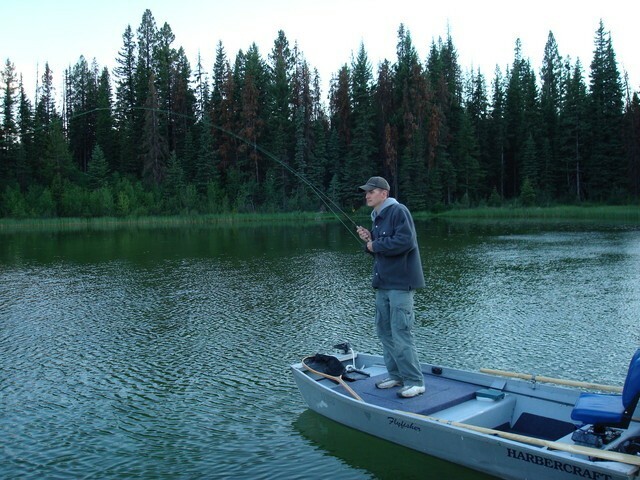 Does the fish follow a retrieved fly almost back to the boat but fail to commit? These are all things you learn that you wouldn’t normally see if you were just blind casting. If the fish are inspecting but refusing a static presentation such as a chironomid I might go down a size or two, or go with a slightly different colour pattern or rib. When fish are following a retrieved fly but not committing I may try a different retrieve to elicit a strike. One interesting behaviour I have noticed is something I call the “sip and spit”. It happens with chironomids hanging motionless under an indicator. The fish is able to approach the fly, inspect it, then gently sip the fly into its mouth and quickly spit it out when it feels something awry. The amazing part is that fish are able to do this without causing the indicator to move at all. Sometimes there is a slight “bobble” on the indicator, but quite often there is nothing. I have run into this situation several times, and the solution I have found is to add a slow, steady retrieve, using a long, very slow pull on the fly line when the fish is near. This accomplishes two things. First, it makes the fish commit to taking the fly a little more aggressively since the fly is on the move. Second, the indicator is much more sensitive when being moved, even if very slowly. Even if the fish just sips the fly, it will stop moving, and the pull on the line from the retrieve will sink the indicator. Quick hook sets are still needed, but I have a much greater chance of hooking these fish with this method. In order to spot the fish you really need a boat so you can stand and search the water from a high vantage point. It’s very difficult to spot fish when sitting low in a float tube or pontoon boat. Some of my friends have built raised platforms in their boats for an even better view. I just stand on my middle seat when needed. An electric motor with an extended handle is also a very valuable tool for searching the shoals. It allows you to keep standing as you slowly cover water, searching for your prey. If you pass over or see large puffs of marl you have spooked the fish before you were able to spot them. The fish is gone and unlikely to return for a while, but make a mental note of the spot to check later. As you get more familiar with a lake you will learn where the fish like to hang out, and where they don’t. 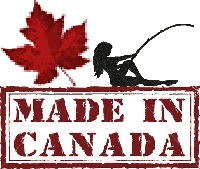 Sight Fishing Rainbows – A Lunker BC Bow on the Run! The flylines I like to employ are floating, ghost tip, and clear intermediate. Any flies and methods you would normally use when blind casting also apply to sight fishing. I am partial to chironies and micro leeches, but any stillwater food item can be used in the shallows. Indicators are very helpful because they allow you to keep your flies off the bottom and leave them in the area of cruising fish for longer periods of time. Indicators are not just for chironies; they can be used with any and all flies. How close you can get to a group of fish without spooking them varies from lake to lake. Some lakes contain fish that are pretty oblivious to boats, and you can get quite close. Other lakes are much tougher, and a stealthier approach is necessary. Landing your fly and line too close can also spook some fish, while others don’t seem to mind as much. If the fish are a little on the spooky side, I like to use an indicator and the wind currents to deliver my fly to the place I want it to go. Anchor so that you can cast across the breeze and away from the fish, then let the fly drift into position over the fish. In some cases the splash of the fly or indicator will actually get the fishes’ attention and will bring them over for a closer look. If you’re using an indicator, the fish may also seem more interested in that than your fly. 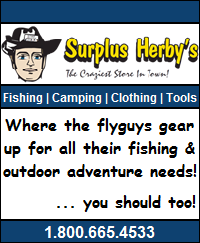 If either of these scenarios occurs, you may have the opportunity to combine two exciting methods of flyfishing– dry flies and sight fishing! Over the years I have noticed three distinct behaviours of fish in the shallows. I refer to the fish that exhibit these behaviours as Zombies, Cruisers, and Muckers. Zombies are fish that are completely still, or moving very, very slowly. These are the toughest ones to catch in my experience. They seldom seem interested in anything, which is why I label them Zombies. The best approach for these fish seems to be large flashy leeches stripped with erratic retrieves. But don’t get sucked into wasting half a day casting to fish of this type; if they show no interest in anything, move on and look for more active fish. 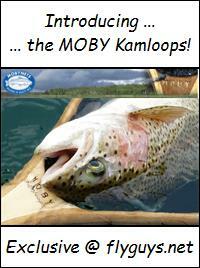 Another Beauty BC Interior Sight Fishing Success Story! Cruisers are fish that are constantly on the move and that often follow the same pattern. If you’re observant, you can watch from a distance and figure out what route they are likely to follow. Generally, they will cruise along the edge of the shoals, then either turn around and retrace their route or loop around into deeper water and then enter the shoal area again. If you notice a pattern, be careful not to anchor in their path. Pick your anchor spot wisely so that you don’t spook the fish. Sometimes spooked fish will return, but often they won’t. Cruisers often swim in groups with other fish and are generally easier to catch when they do. Often a fish will aggressively take your fly for fear that another fish may beat him to it. Cruisers are my favourite, and are the ones I find easiest to catch. They will usually be near the bottom, but sometimes they can be at mid-depths; for example, they may be at three feet in six feet of water. Adjust your presentation accordingly. Muckers are fish that stay very close to the bottom, and are often pointed slightly downwards as they closely inspect the marl for food items. They often stir up the marl as they move. These fish are focused on the bottom, so your fly must be presented on the bottom or very close to it. These fish can be very selective, as they are often searching for a particular food item, and will often reject anything else. Scuds worked slowly along the bottom are very effective, as are immature damsels and dragons. Most of our quality stillwaters receive triploid trout that do not get spawnbound, but some lakes still have diploid trout that attempt to spawn. It’s generally frowned upon to target these fish that are often in the shallows. They are trying to dump their eggs or milt and are often in rough shape and provide poor sport. These fish are easy to differentiate from clean fish by their dark appearance and bright red stripes. Sight Fishing Rainbows … now that’s what it’s all about! If you have never experienced sight fishing I must warn you that it is very addictive. You may turn into a sight fishing addict and spend your days slowly cruising the edge of the shoals with your hands cupped around your polarized glasses, peering obsessively into the water for signs of movement. Inevitably, at some point you will waste a half hour or more casting various flies to a stick or debris sunk into the marl, wondering why it won’t take anything. Consider it a rite of passage and something we have all done. On the other hand, a “stick” might explode out of the water—something we keep coming back for. This entry was posted in Still Water Fly Fishing and tagged Fishing Techniques, fly fishing, Rainbow Trout, Sight Fishing, Still Water. Bookmark the permalink.